Workers are dismantling the wharf at Jericho Beach, a final physical reminder of the Habitat Forum in 1976. Lindsay Brown photograph. The battle of Jericho is over and the wharf is tumbling down. Workers are dismantling a wooden structure that juts over the shoreline at Jericho Beach on Vancouver’s west side. Pilings, soaked in creosote, will be removed and the beach restored to a more natural setting. The decorative metal railings that lined the wharf, against which lovers and sightseers leaned while gazing onto the waters of English Bay, are being stacked for future use, possibly in Stanley Park. The railing once prevented pedestrians from falling off the Lions Gate Bridge. The bridge had been undergoing a refurbishment and the railings were no longer needed. A visionary named Alan Clapp knew how to use them. Thirty-five years ago, a sleepy and rough-edged port city played host to the inaugural United Nations Conference on Human Settlements. It was Vancouver’s reluctant debut on the world stage. Local politicians balked at the policing expense, fretting about the violence of the Middle East finding expression in a Pacific city, puzzling why a conference on sheltering the world’s poor was being held in wealthy Canada. While government officials and other bigwigs met at swank downtown hotels, Mr. Clapp, a television producer with a reputation as an “ideas man,” organized an alternative conference on the site of an old Royal Canadian Air Force seaplane base. A persuasive and indefatigable go-getter, Mr. Clapp negotiated use of the site and gained modest financial support from an NDP provincial government and its Social Credit successor. Cavernous aircraft hangars left over from the Second World War were modified to resemble native longhouses. Architects designed innovative seating in the hangar used as a plenary hall, as giant wooden blocks were stacked like a giant Jenga game. A massive banner covered the entire ceiling. Horses hauled driftwood off the adjacent beach. Wood was milled on site. The artist Bill Reid created a magnificent mural on the exterior wall of one of the hangars. Hundreds of school children volunteered, helping to keep the area clean. Instead of being discarded, the old bridge railings were salvaged for use on the wharf, a scenic centerpiece. The Habitat Forum ran in conjunction with the official meetings. It was an independent, grassroots alternative with open doors to all. Habitat attracted such luminaries as Mother Teresa, the anthropologist Margaret Mead, and the futurist Buckminster Fuller, whose geodesic dome had been such a hit at Expo 67. 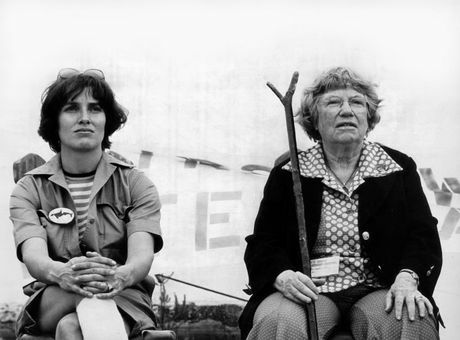 Margaret Trudeau, the prime minister’s wife, joined others in hauling water to the site by pail to demonstrate the daily difficulty so many of the world’s poor faced in simply providing a clean and safe drinking supply. Habitat was chaotic and creative, an admirable attempt to ensure the public could have a voice in tackling the problems of poverty and sustainability. For some who attended, such as Lindsay Brown, then a 13-year-old high school student, the week-long gathering was an unforgettable experience. “It was an exciting environment. It had this strongly Utopian feel,” she said. She long held a nostalgic feel for the gathering, an emotion she assumed was unique to her. Two years ago, she began researching a book about Habitat, some of which can be found on her blog. She discovered the conference had a lingering hold on those who attended. “It had been formative for a lot of people who then went on to take a more global standpoint in their own work,” she said. The United Nation’s department responsible for settlement issues is still known as UN Habitat and its founding document is The Vancouver Declaration, an unrealized blueprint. Margaret Trudeau (left) joins Margaret Mead at Habitat Forum in Vancouver in 1976, a chaotic, colourful gathering that tried to tackle the problems of shelter and poverty for the world's people. The beach’s Biblical name has a more prosaic origin. Long the site of an aboriginal village known as Ee’yullmough, the original residents were shunted aside with the arrival of Europeans. Jeremiah (Jerry) Rogers, whose axeman fell the giant trees of Point Grey and Kitsilano, established a camp and spar-cutting operation at what became known as Jerry’s Cove. Over time, the name mashed into Jericho. The construction of the alternative conference known as Habitat Forum lured an eclectic crowd to the shores of English Bay at Jericho Beach.